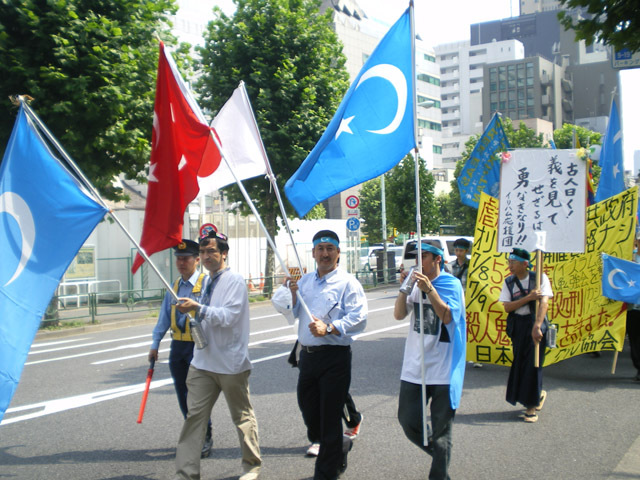 On 3rd of August, Japan Uyghur Association carried out its second demonstration from Shiba-Kouen to Hibiya-Kouen passing through Sinbashi station and Ginza. Out line of this demonstration was "Demonstration against Olympic of Human-Rights Abuse and Human Sacrifice <Free Uyghur, Free Tibet, Free Mongolia>" and we conducted the demonstration to protest China hosting the Olympic though human rights are broadly abused within China. Dalai Lama is not opposing to the Beijing Olympic for diplomatic concerns, but I assume many Tibetans are against the Beijing Olympic deep in their hearts. 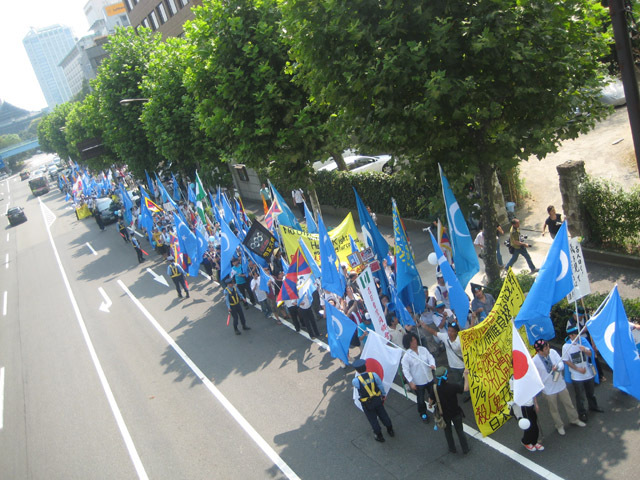 On the other hand, World Uyghur Congress is against Beijing Olympic, so Japan Uyghur Association decided to define that they are against the Olympic by this demonstration. For the previous demonstration on 25 June genuinely surprised the president and authorities of World Uyghur Congress in Germany and Headquater in the United States. So this time, we tried to invite someone with leader figure like Ms.Rabye, the President or Mr.Seyit, the Vice President of World Uyghur Congress to join the demonstration. As Ms.Rabye was not in very good condition, Mr.Seyit agreed to participate. Mr.Seyit will be regulating newly established Japan Uyghur Association together with Mr.Ilham, the World Uyghur Congress Representative in Japan. He arrived on 1 August and we had a welcome party for Mr.Seyit and final fix meeting for the staff. The staff gathered at 11 o'clock to prepare the assembly ground, flags, ballons and reception. As the demonstration was conducted in mid-day in mid-summer, we watered the ground in order to avoid heat prostration. The previous demonstration did not go so easily as everyone was not used to the demonstration, but this time leaders initiated each group and we could resolve some small problems without trouble. Opening ceremony started at 1pm and following are the people who gave speech with Mr.Kamizono, the leader of Ilham Cheering Party. Each person mentioned that the battle against Chinese Communist Party is not to be carried out by Uyghurs alone, but also Tibetans, Mongolians, other 'ethnic minorities', Taiwanese, democratic activists against China and Japanese are to unite together with Uyghurs to conduct the battle. The effect of the demonstration was 'Objection for the Olympic of Human-Rights Abuse and Human Sacrifice' but we also wanted to point out 'Wake up, Uyghurs' and 'Wake up Japan', meaning Uyghurs whose existence is staked must wake up and Japan must wake up as well. One Uyghur person interpreted speech of Mr.Seyit, the vice President of World Uyghur Congress. The person is the vice Chairman of Japan Uyghur Association, Mr.Yunus. He is the second Uyghur who stepped out for the activities. I believe there will be more Uyghurs stepping out following Mr. Ilham and Mr.Yunus. To meet their expectation, we Japanese must make the best of it. World Uyghur Congress Vice President, Japan Uyghur Association Representative Director, Mr.Seyit and Japan Uyghur Association vice-Chairman, Mr.Yunus. We prepared badges, Origami cranes and various goods as well as balloons and they made the demonstration gorgeous like the previous one. We mainly chanted the slogan 'Free Uyghur, Free Tibet, Free Mongolia, Free Taiwan' and we also chanted other slogans like 'Stop killing, Stop malicious arrests, Stop abduction and kidnapping girls, We don't want Olympic without human rights, Return Mr.Tohti to us, Save the victim of nuclear tests'. As a Japanese supporter requested for Uyghur slogan, we chanted 'Oyghan Uyghur (Wake up, Uyghurs), Oyghan Yaponiya (Wake up, Japan)'. Though Uyghurs suggested 'Uyghur largha erkinlik (Liberty for Uyghur)' we had to reject it as it is difficult for Japanese to pronounce. It was unfortunate that there were not many people on the street during the demonstration. For next time, we will choose the good location and hope we can make an appeal for more people. People participated the demonstration brought various flags. Apart from National Flag of East Turkistan, there were Flag of Japan, Tibet, Inner Mongolia, Taiwan, South Vietnam and Turkey. 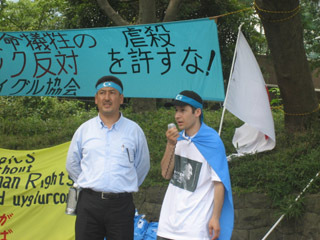 We were surprised to know that rightist group joined the demonstration but they reacted very politely when Mr.Shiraishi and I went to talk to them. They agreed to the effect of the demonstration, chanted our slogans and they even prepared two cars for the ambulance use. We really appreciated their support. I suppose not only the rightists but also more people in different position will be joining our activities and I hope all of us will be able to unite and support East Turkistan beyond each person's political position. To achieve that, we, the Japanese supporters need to have a proper philosophy and create a structure that help us continue the activities without deviation and Japan Uyghur Association must have a strong structures. For the concerned heat stroke, thank god, there was none sent to hospital, though there were 8 rested in the car in ambulance use. As this demonstration was conducted the hottest time of the day, I hope to plan a low-impact demonstration fot next. After the demonstration, I told Mr.Seyit that there were 400 people joined and he was happy to hear that. I guess it helped encouraging them a lot. Mr.Seyit was moved to see staff working very hard as well as a number of people participating. On his previous visit, he said 'I think Japan will be like Turkey, the adopted home for Uyghurs' and I hope to maintain the activities in Japan to make his words come true. I would like to thank the participants and the staff. Next activity will be the study session and I expect there will be an activity that introduces Uyghur culture. We are not planning any demonstration hosted by East Turkistan group, yet there is a possibility of having a demonstration together with Tibet and Mongolia as we are moving closely together now. We may also have a demonstration or meeting on the Independence day of East Turkistan in November. We, East Turkistan supporters, hope to sort out ourselves to be able to move on a systematic basis. I am glad that this demonstration gave us a tip for it. We received donations from a number of people. We will devote it for the cost of this demonstration. Thank you very much. For this demonstration, the volunteers distributed the 'Origami crane'. Click here for the (Japanese) Report.